Worried that the Internet may be dumbing you down? Well, addiction to the Internet may not be a bad thing after all. 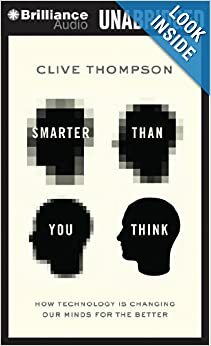 In fact, Clive Thompson, author of Smarter Than You Think has given us reason to believe why using the Internet can actually make you smarter! Even though Thompson agrees with the popular opinion that the Internet and devices, like smartphones, can be distracting because you are constantly jumping from one thing to the next, he admits that his life is “richer and deeper thanks to new technologies.” We can all admit that thanks to these technological advances that barely existed a couple of decades ago, it is easy for us to surf the web and stumble upon articles that can teach us something new. Thompson’s book stresses how using the Internet can benefit children in low-budget schools by helping them learn in unique ways. Unfortunately, only certain subjects, like English, will benefit from these technological advances. Thompson predicts that students composing a writing assignment will work harder if it is generated towards a larger audience – much like how adults compose their thoughts by blogging or on Twitter – rather than to just their teacher. In addition, a comment from a complete stranger outside the classroom will increase a student’s motivation to work harder because their thoughts are now affecting others, rather than a teacher’s comment that can be read and shrugged off.